I was introduced to this recipe by one of my close friends (who, for the record, has never been able to cook!) but this one surprised me. It’s beautifully creamy and has so much flavour to it. Try it for yourselves. 1. Preheat oven to 180 (fan). Fry the sliced leeks in butter for 3-4 minutes until just tender. Add risotto rice and stir for 2-3 minutes. 2. Add stock and milk and bring to boil. Leave to simmer for 5 minutes. Transfer ingredients to an overproof dish (the original recipe recommends doing 1. and 2. in the ovenproof dish if you wish) and place fish on top. Cover with foil and place in the oven for 20-25 minutes, or until rice feels soft. 3. Fold in spinach and recover leaving the dish on the side - the steam will wilt the spinach. Season with pepper. NB. 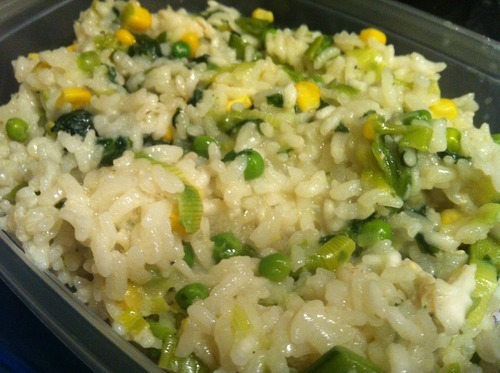 I added frozen peas and sweetcorn - you can add any vegetables you wish. I also used frozen spinach and put the in with the fish, obviously if using fresh spinach you can follow point 3. 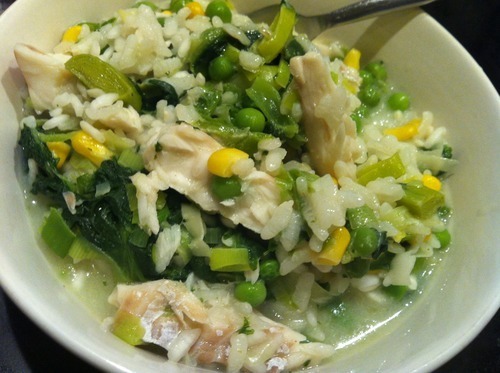 Risotto is such a simple dish to make and with so many varieties you can never tire of it.